This week's CAS-ual Friday challenge is to use Kraft. For this card, I cut and stamped the kraft panel with the million little dots, concentrating them in the centre and spreading them out towards the edges. Then I stamped the Stampin' Up sentiment in black on the kraft panel. Didn't like it. And thought about a new and exciting (for me) way to create a new sentiment area. I got out my craft knife. Yes, they let me use sharp tools around here (how else would they get fed?!). I cut two slits in my white mat layer and slid the kraft panel through. It's loosely attached, but I wanted it to look quite casual as if it was sitting in there on its own. Hope you're having a wonderful weekend. Kate and I are going to see a live production of Willy Wonka tonight with one of my sisters and her two children. It will be a very late night (the theatre's two hours away, where my sister lives), but we're looking forward to a fun dinner with Grandma and Grandpa and then the show! Hope you had a great visit with your family! And how was Wee Willie Wonka? Oh em gee!!! This is SUPAH fabulous!!! I love everything about this design, Ardyth!!! Sounds like a fabulous night! 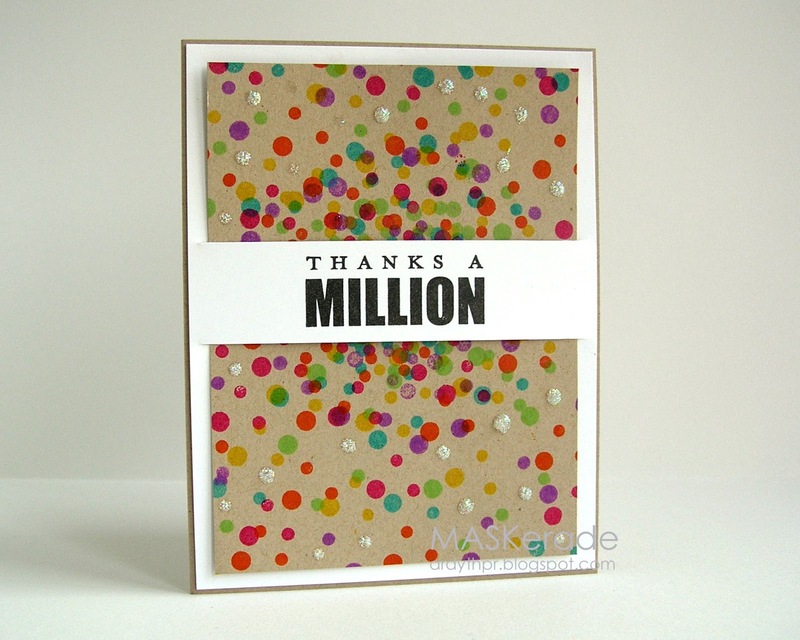 Love your card...all the colors are fabulous on the kraft panel. Thanks so much for playing with us at CAS-ual Fridays! What a clever idea to cut those slits! And of course I love those colorful and sparkly dots! FUN card -- your mind works well! Fun times ahead - I bet that play is super fun -- Enjoy! You've done it again......totally unique! I'm sure there is some trick to making those dots look random, but I'm gonna try it anyway. Thanks for the inspiration. I thought you were going to say you cut the sentiment off and put the pieces back on either side of the stamped sentiment. You fooled me. Great idea. Very creative Ardyth! Love your million dots. Yep, love the kraft behind your white slip, with the few glitter dots! Looks like a million bucks!! Love the explosive of colors!! This is fabulpous! So glad that you join the fun with us at CAS-ual Fridays! Awesome card!!! Love teh background you created!! Thanks for sharing your KRAFTY creation with us @ CASual Fridays! I *LOVE* how you fixed the card with the white panel sentiment! Genius and beautiful! The multi color dots are amazing! Thanks so much for playing along with us this week at CAS-ual Fridays! Ardyth, this is sheer genius! You amaze me! Thanks for joining us at CAS-ual Fridays! !